Legend beckons a romantic schoolgirl to await her future husband in a forest at the time of the hunter’s moon. When a handsome stranger appears, Cordelia Grant wonders if she is dreaming. But time will prove this fateful encounter to be all too real and far beyond the reaches of a young girl’s imagination. Haunted by the memory of her mystery man, Cordelia begins a new life as schoolmistress at a girls’ academy. 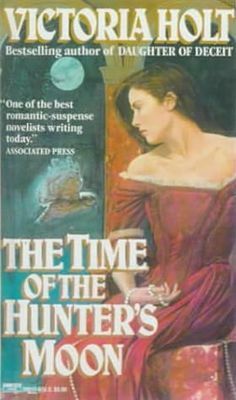 In Devon she finds herself pursued by Jason Verringer, a dashing land baron with a scandalous reputation. Cordelia knows she should despise the man who, it is rumored, murdered his wife and mistress. But to her dismay, he begins to invade her thoughts–and to compete with the carefully preserved memory of the fair, handsome stranger from her schoolgirl days. 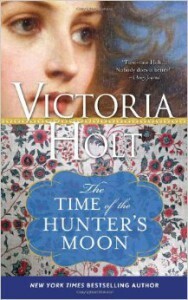 In Victoria Holt’s newest page-turning tale of love and intrigue, her heroine discovers that people are not always who they appear to be. Good and evil wear many faces. Among them lurk two men. One is a murderer; the other is a lover. Cordelia’s destiny depends on finding both. From the ordeal will emerge a woman who has listened to her heart and has found true love. Victoria Holt is a virtuoso storyteller whose prodigious output has given her grateful fans over twenty-five international bestsellers. 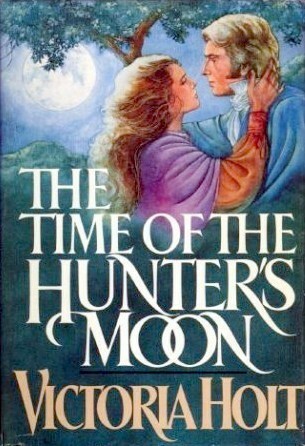 THE TIME OF THE HUNTER’S MOON, once again, is a unique blend of spellbinding suspense and romance that has become a Victoria Holt trademark.